Nagarkot is a favorite destination for tourists starting the Nepalese Adventure. Situated at about 35 km from Kathmandu it is relatively easy accessible by road. You can get there from Kathmandu in about 2 hours. Surprised? Well, this is because you did not experience yet the Kathmandu’s traffic and roads (more on that in the coming soon “The Road to Kathmandu” page describing my experience from the crossing of Himalayas by car from the Tibet to Kathmandu). I have to make it clear that Nepalese roads only sometimes deserve such “dignified name” as most of them are rather in the “sorry state” so to speak. To some extent it may be not that surprising because the northern Nepal mostly encompasses the area of fast dropping Himalayan ranges. For us westerners, it is quite hard to see the full geological picture of what the Nepal is (because we rarely learned in schools something about this part of the world). Muddy road reminds that the monsoon season ended not that long ago. The truth is that unlike on the Tibetan side, the Nepalese landscape quickly drops from the elevation of highest Himalayan Ranges along the northern border (with 8848m Mt. Everest) to the level of lowlands at 80 meters above the sea level on the south. And all that happens over the relatively narrow stretch of the Nepalese territory. You can only try to imagine what is mostly beyond the imagination. Steep hills and towering peaks, interleaved with dangerously deep canyons flooded with torrential rivers, zillions of waterfalls to name only few “ingredients” of the Nepalese northern landscape. And for sure frequent landslides, devastating boulders rolling down at the speed of light or may be even faster…. On the right: Views from the room's balcony.... what would you say....? 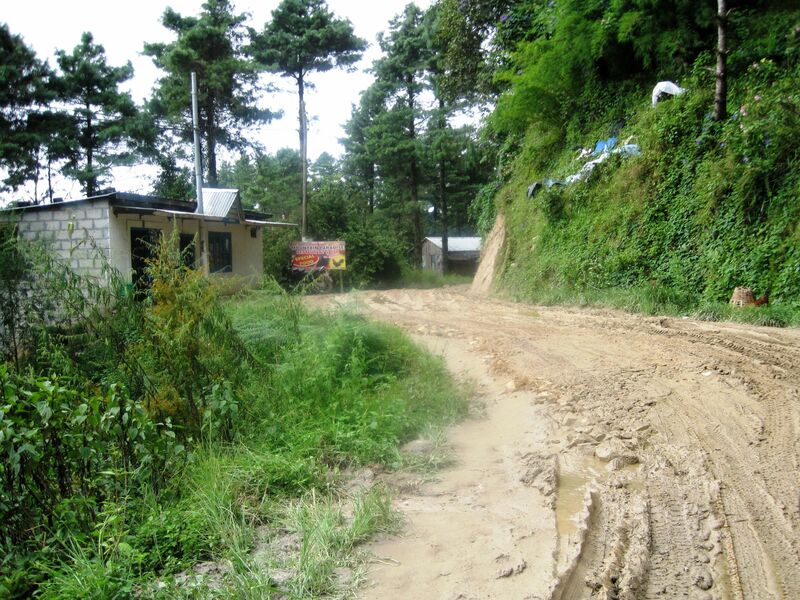 All that does not make it easy for building any road infrastructure, specifically in this relatively poor, resources and money strapped Nepal. Actually as far as I know – Nepal’s biggest industry is tourism, and the biggest natural richness (besides the unspoiled Nature) is WATER. Nepal is the 2nd water- richest country in the world, but because of the lack of the proper infrastructure from time to time you will find that in Kathmandu there is no tap water in your hotel room. 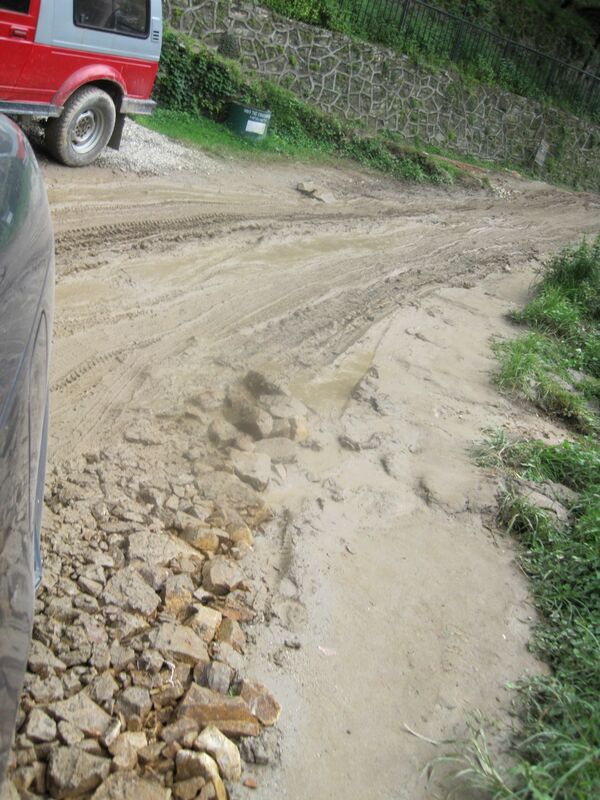 Finally driving along the winding muddy road we reached the Hotel Country Villa. The main building is located on the edge of the hilltop and most of it extends down the slope. That location results in fantastic and undisturbed by any man-made structures views. In a good visibility day the view from the hotel’s windows and terraces extends far beyond the valley reaching on the distant horizon the snow-capped Himalayas. The contrast of green valleys, dotted here and there with the meadows of wild flowers and the rocky, inundated by the sun snow-covered peaks is breathtaking. Although the best Nagarkot hotels are offering to their customers are the captivating views on the unspoiled landscape, it is worth to mention that they also provide very comfortable accommodations. The Country Villa Hotel has all rooms well furnished with wooden paneling, 24-hours hot and cold water, electric heating for chilly nights (remember, the Country Villa hotel is situated at 2200 meters above the sea level) and the best – the huge balcony with the panoramic view limited only by the more or less distant horizon line. The open air restaurant on the wooden terrace hanging over the slope of the hill allows you to savor your delicious meal in wilderness-like environment. Large selection of drinks from the bar is guaranteeing “completeness” of your stay in the hotel.